The musicians of Mumford & Sons can be freely called young, but promising artists. 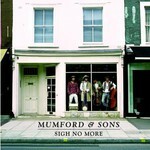 This year, their debut disc Sigh No More saw light. However, they are not actually new to the British scene, as they started performing in 2007 already - first, as the supporting and associated act with the more popular folk-artists. Nevertheless, due to their wonderful tunes and magnificent arrangements, the artists soon made their own way in the career stardom and decided to record a disc. Their music is the mixture of drive, emotions and diversity of instruments (including ethnic ones like dobro) in the interpretations of the songs. In spite of the title, in which the surname of the soloist and leader is used, the other members of Mumford & Sons are surely not his sons or even relatives. This title is the remembrance of the local family businesses of all kinds, in which the deal came from father to his sons generation after generation. They succeeded in this field for sure – take in consideration at least the fact that the artists resurrected the long ago dead interest of the big public to banjo. Although the musicians are mostly famous for their heart-grasping life performances, their first attempt Sigh No More will definitely cheer all the folk-music appreciators. From the first listen, the album Sigh No More strikes with its poly-sidedness – from the tunes to the arrangements. In this respect, we should never under appreciate the work of producer Marcus Dravs, who is known for his cooperation with such British and word stars as Coldplay and Bjork – he really assisted the artists to record a wonderful disc, worthy to state about it aloud. The disc opens with the tuneful track Sigh No More, which gave the title to the long-play and set the pace and to mood to it from the very beginning. It is followed by the decorated with horns folk-number The Cave, which gives way to the beautiful melody Winter Winds with the trumpet solo as the climax. In the motifs of such praiseworthy tracks as Roll Away Your Stone and Thistle & Weeds you can clearly here the Celtic roots, while the mournful songs White Blank Page and I Gave You All are the classical tales of the broken heart. It looks like the last two mentioned tracks are of autobiographical character for the soloist of Mumford & Sons. The single Little Lion Man has already become a hit in Great Britain, and it is of no wonder – it possesses a strong pop melody and infectious chorus. The bright and original track Timshel is the successful result of mixing bluegrass and gospel, while the motif Dust Bowl Dance is undoubtedly the strongest ballad on the disc and centers around the piano play. The album finishes with the pedestrian and tender elegy After The Storm. The disc Sigh No More must be definitely called a much promising debut. It possesses integrity – both in lyrical and musical relations. However, at the same time the album can boast of a pleasant diversity in the matter of sounds and arrangements. It is so easy-going and tuneful from the beginning to the end that it will win the attention of both the folk-lovers and other genres’ listeners. As it was said earlier, a special role in the creation of the disc was played by producer Marcus Dravs, who helped the musicians of Mumford & Sons show in the studio all that they are able for on the scene. He brilliantly managed the message in spite of the fact that sometimes first-rate life tracks sound colorless and uninteresting in the studio performance. Well, as for the recording place, we should also notice the headquarters that the artists chose for the work over Sigh No More – it is the Eastcoast Studios, where such performers as Arctic Monkeys, Brian Eno and Lora Marling recorded before Mumford & Sons. No wonder, that the sound of the disc is above all praises. Nevertheless, as almost every debut attempt, Sigh No More has its dark moments. Firstly, it goes about the lyrics – the artists should develop their narration skills. Secondly, the album has a couple of filling tunes, although they are pleasant and qualitative. Well, all these insignificant drawbacks are nothing in comparison to the merits of Sigh No More.